Bring a fresh, classic look into your bathroom with this vanity. With a white marble counter and white solid wood base, this piece is very stylish. Put a nice twist on your bathroom project with this classic piece from Wyndham Collection. This vanity is a great way to add traditional style to your bathroom. 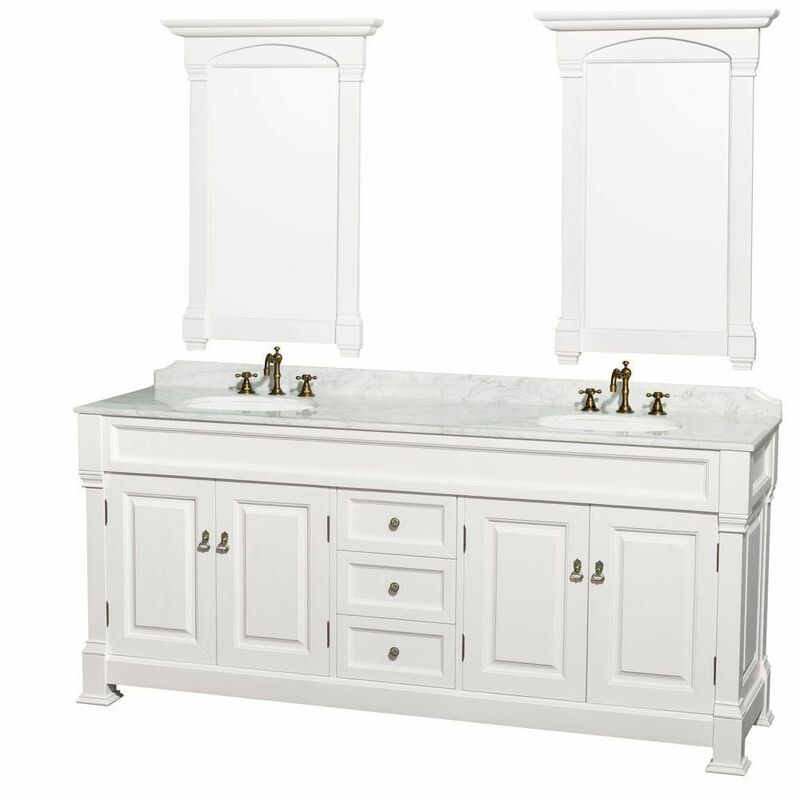 The white marble counter and white solid wood base make a beautiful look in your bathroom. This simple vanity set from Wyndham Collection will fit right into any bathroom decor. Andover 80-inch W 3-Drawer 4-Door Vanity in White With Marble Top in White, 2 Basins With Mirror Bring a fresh, classic look into your bathroom with this vanity. With a white marble counter and white solid wood base, this piece is very stylish. Put a nice twist on your bathroom project with this classic piece from Wyndham Collection. Andover 80-inch W 3-Drawer 4-Door Vanity in White With Marble Top in White, 2 Basins With Mirror is rated 4.5 out of 5 by 4. Rated 5 out of 5 by ray from I purchased this vanity for its original price. It is beautiful! It exceeded my expectations. ... I purchased this vanity for its original price. It is beautiful! It exceeded my expectations. I highly recommend this product! The sale makes it a steal! Rated 5 out of 5 by Jimmyhodges from Need to put this item on sale Great cabinet but a littl e pricee need to sale wood buy it and two linen cabints with order buy being contractor they tend not t o put sale so we can move more of them. Rated 3 out of 5 by Michael from Poor Quality for the price, but Good Service from the Manufacturer The delivery guys were good, but they didn't bring things to the second floor - though that wasn't specified in the original notes for the order. A quick call to Home Depot got our delivery charge reversed so that was nice. However, the first top arrived with some areas that looked like they had been scratched and buffed out so they didn't have the same finish as the rest of the surface. After another call to Home Depot, and then the manufacturer, they were able to send a replacement top. The second one had the same sort of defect, but only in one spot in the back near where the faucet goes in so it is mostly blocked from view. Good enough. After the install though, we noticed that the doors were all cracking along the seams. and two were actually splitting on the flat parts in one or two spots. I replied back to the email I had going back and forth with the manufacturer asking to get replacement doors. After sending some pictures of the defects, they said they are going to ship out new doors as well. They are due to arrive in about 4-6 weeks from now, so I hope they come in with no problems... but that remains to be seen. All in all, this piece didn't live up to the quality I expect for the price. On the plus side, the drawers seem solid and slide smoothly, and the mirrors are really nice. However, the manufacturer was responsive and helpful in trying to make up for their shortcomings.